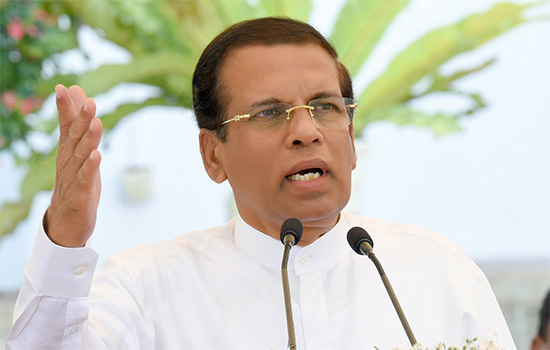 Colombo, April 12 (Daily Express): Earlier this week, the General Secretary of the Sri Lanka Freedom Party (SLFP), Dayasiri Jayasekara, told the media that the chairman of his party and Sri Lankan President Maithripala Sirisena, intends to seek the opinion of the Supreme Court on the plea that his term of office should be deemed to have begun on June 21, 2015 and not January 9, 2015. President Sirisena was sworn-in on January 9, 2015. But Jayasekara pointed out that the nature of the Presidency was altered by the 19 th.Constitutional Amendment which was signed into effect by the Speaker of parliament on June 21, 2015. Therefore, Sirisena’s term should be deemed to have begun on June 21, 2015 and not January 9, 2015. It should be deemed to be ending on June 21, 2020 and not on January 9, 2020. Sirisena has been wanting to be a joint Presidential candidate of the SLFP and the Sri Lanka Podujana Peramuna (SLPP) in the coming Presidential election. He has been working hard launching popular campaigns on various issues to build up his image among the masses – an image which had suffered a beating because of his association with the right-wing and pro-West party, the United National Party (UNP) since 2015. But the SLPP, which is but a breakaway group of the SLFP, is insisting that the Presidential candidate should be from its ranks. It feels that its candidate has the best chance of winning going by the stunning victory it attained in the local bodies elections in February 2018. Given this situation, the next best thing to do for Sirisena, was to try and stay on in office beyond January 9, 2020 to June 21, 2010 so that he can use the time to execute his political projects and buttress his claim to be the joint opposition candidate. With the prospective SLPP candidate, Gotabaya Rajapaksa, in a spot of trouble over getting release from US citizenship because of two civil suits filed against him in a US court, there is an off chance that the SLPP might be forced to field Sirisena instead of Gotabaya Rajapaksa. Earlier, in January 2018, Sirisena had wanted to know from the Supreme Court if his term was for five years or six. The Attorney General had told the court that since Sirisena was elected in January 2015 for six years, its reduction to five would be a violation of the people’s sovereignty. The 19th.Amendment which came into effect in June 2015 had reduced the Presidential term from six to five years. The court, however, ruled that as per 19A the five-year cap applies to him too. While this is so, Sirisena’s bid for a longer term is not unique. Almost every Sri Lankan President except R. Premadasa and D.B.Wijetunga, had sought extension, though no one other than J.R.Jayewardene had succeeded. Ironically, Chandrika Kumaratunga, Mahinda Rajapaksa and Maithripala Sirisena had all come to power with a pledge to abolish the Executive Presidency and go back j to the pre-1978 Westminster-style parliamentary system. The Executive Presidency was brought to Sri Lanka by Prime Minister J.R.Jayewardene, through the promulgation of a new constitution in 1978. The new constitution gave a directly elected President a six year term and not five as before. Parliament also got a six year term instead of five. Jayewardene named himself the first Executive President in 1978. Subsequently, the first direct vote to elect a President of Sri Lanka was held in 1982. Jayewardene, who was a candidate, got 52% of the votes cast and was declared elected. In order to maintain the UNP’s parliamentary super-majority obtained in the 1977 elections, Jayawardene decided to extend the life of parliament without holding direct elections. In order to do this, his government presented the 4th constitutional amendment in 1982, which proposed to extend the life of the parliament by six years to August 4, 1989. The bill was found to be constitutional by the Supreme Court but it had to be passed by a two thirds majority and ratified through a referendum. Both were done successfully by Jayewardene. Jayewardene’s plea was that such measures were needed to turn the Sri Lankan economy around. The State had to be powerful and stable. Sri Lankans, who were tired of the shortages and strikes which marked the socialist regimes headed by Mrs.Sirimavo Bandarnaike of the SLFP, went along with Jayewardene. The next bid to extend the term of the President was made by President Chandrika Kumaratunga. Her term was to end in 2005 but she argued that because she had called for a Presidential election one year ahead of time in 1999, she should be able to get one more year in office over above the normal six years. To be able to make this claim, she said that she had taken oaths for the second time at the end of 2000 albeit secretly. The idea in taking the oaths for the second time was to be able to count the beginning of her term from 2000 and not 1999, and be President till 2006 and not 2005. This was challenged by the prospective Presidential candidate and fellow SLFP member, Mahinda Rajapaksa. When the matter was taken to the Supreme Court, Chief Justice Sarath Nanda Silva ruled that Kumaratunga’s claims were untenable and that her term would end in 2005. The constitution had clearly stated that the term of the President begins on the date he or she is sworn-in. And there had been a public swearing in immediately after her victory in 1999. But Kumaratunga had said that she was constitutionally empowered to continue her present term of office until 2006, whatever arguments were advanced to the contrary. She said it was her prerogative to step down before or otherwise. But the Supreme Court thought otherwise. When he came to power in 2005, again on the promise that he would abolish the Executive Presidency, Mahinda Rahapaksa tried to be President for more than the constitutionally stipulated two terms. He brought in the 18 th.Amendment to the constitution to remove the two-term cap. But this was annulled in 2015 after he was defeated by Maithripala Sirisena in collaboration with the UNP. The Sirisena-Wickremesinghe government brought in the 19 th.Constitutional Amendment which restored the two-term limit set by the 1978 constitution which brought in the Executive President. The 19 th.Amendment also reduced the terms of the President and parliament from six to five years. However, for his personal political reasons, President Sirisena is now trying to get the Supreme Court’s approval for an extension of his term from January to June 2020. But success is likely to elude him as it did in the case of Kumaratunga and Rajapaksa.